Election time over here in France… Dear neighbors, there has been a coup d’état in our home ! On our table the traditional « vinaigrette » has been overthrown by this dressing! It was predictable : it had been sneaking in ever since my veggie bowl recipe last fall. 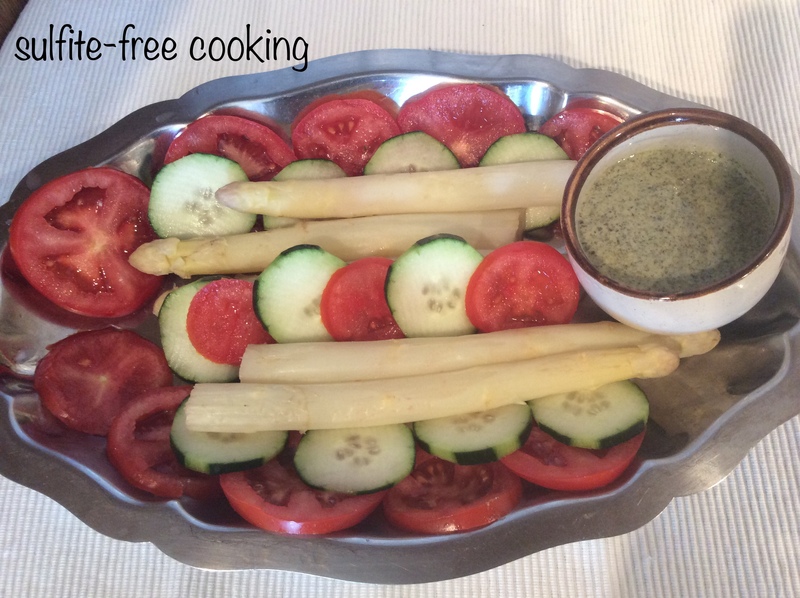 And yesterday, as I served it with fresh asparagus, tomato and cucumber slices, our kids, who are vegetable lovers, elected it Dressing of the Year ! This dressing perfectly complements beets, avocado, hard-boiled eggs and is a great option for all neighbors who are looking for something thicker than the usual drizzle of oil and lemon juice. Also excellent on a green salad; just make it a little thinner by adding more water. Mix ground seeds, salt and vinegar ; add olive oil, then gradually mix in water until desired consistency. This dressing can be stored in a small jar, to be closed tightly to avoid drying up. P-S: I use an old coffee grinder to turn my seeds into “pumpkin meal”; but any food processor should do the same. Sounds delicious – must try! Thank you Dolly, I hope you like it! I am sure I will, after Passover. I make a similar dressing with sunflower seeds, but I dry-roast them first. “Pepitos” sounds interesting to try. Oooh, this sounds good! We both like pumpkin seeds, whether ground or toasted. I need to give this a try too. Turmeric is something we eat and also drink in tea; as you said in your post, it has wonderful anti-inflammatory properties! Take care, and happy Easter!